Back in the late 19th century, the Round Lake area in Price County would have been teeming with boisterous activity right about now. The arrival of spring marked the end of the logging season that flourished in the surrounding forests in those days. Lumberjacks would set up camp in the winter amidst the trees and fell the tall pines that were in great demand all over the Midwest, then haul the logs to the frozen Round Lake to await the spring thaw. Come springtime, when the thick ice finally broke, activity shifted from the forest to the wooden dam that harnessed the power of the water. Lumberjacks would lower the gates of the dam, releasing the energy that pushed the logs down the shallow South Fork of the Flambeau River. Men would guide the logs downstream to the sawmills that turned the timber into lumber, which would be used to build cities and towns all along the Mississippi River. Today, Round Lake in the springtime is much quieter. The lumber-boom era of the late 1800s is long over—the warm weather now brings people guiding canoes and kayaks downriver rather than piles of logs. The historic Round Lake Logging Dam before and after restoration. However, the Round Lake Logging Dam itself is still there in about as close to its original form as 140 years will allow. Most 1800s logging dams disintegrated long ago, or were replaced with concrete dams to create lakes. 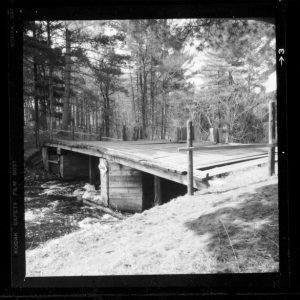 But thanks to a partnership between the USDA Forest Service, the Price County Historical Society, and a dedicated crew of volunteers who formed the Friends of the Round Lake Logging Dam, the structure has been painstakingly rebuilt in its original wooden form and is now the only dam like it left in the entire state. 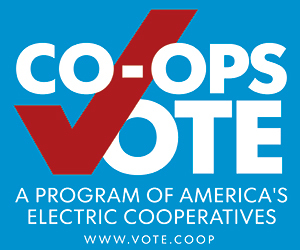 “These efforts by the community and the dedicated partners were rewarded with a once-in-a-lifetime opportunity to tie the present to the past, and the present to the future,” said Price Electric Cooperative member Manny Stein, a member of the Friends group. Stein served a 35-year career with the U.S. Forest Service, and upon retiring he took to building log houses. “I think I’ve got a little sawdust in my blood,” he admits. No surprise then that he was also actively involved in the dam’s restoration project that began in 1995. 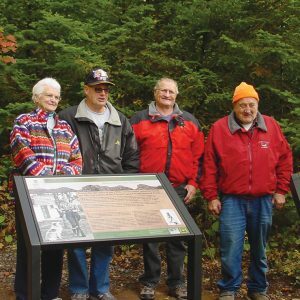 The restoral efforts included the development of an accompanying groomed, half-mile interpretive trail dotted with kiosks telling the history of Round Lake. Listed on the National Register of Historic Places, Round Lake Logging Dam attracts visitors who come to get a close-up look at the dam’s unique original design and get a feel for what the life of a lumberjack was like back in the 1800s, when the logging industry was the backbone of the state’s economy. The Round Lake Logging Dam was built in 1878. 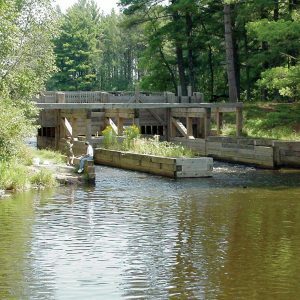 According to the Price County Historical Society, it was one of about 100 dams that kept pine logs moving from Wisconsin’s northwoods to the sawmills in the Chippewa River Valley. Log drives were regular spring occurrences for the following few decades, but the seemingly endless supply of towering pine trees was eventually depleted by over-aggressive logging. After 1910, log drives were infrequent and led only to local mills just down the river in Fifield. Price Electric member Manny Stein (third from left) was one of the volunteers who helped restore the Round Lake Logging Dam. He and his sister Betty (left), were also subjects of a 2006 oral history project. In 1915, Otto Doering purchased some land along the shores of Round Lake and set to work restoring the overlogged landscape, including the deteriorating dam. He used as many original timbers as he could, but in an unfortunate twist of fate he had to import long logs from the west because the local supply had been exhausted at the height of the logging industry. He built a camp-like retreat on the property, which the Doering family sold to the USDA Forest Service in 1968. Efforts to stabilize the dam continued; however, Stein said by the 1980s it was clear the dam would have to either undergo a major reconstruction or be taken down. That’s when the USDA Forest Service, the local historical society, and the newly formed Friends of the Round Lake Logging Dam joined forces to restore the historic structure. First came years of research and environmental study to ensure the water quality and fish-spawning areas would be unharmed. The original dam was meticulously dismantled in 1992, with each piece carefully recorded and photographed so when it came time to put the dam back together, it could be done as authentically as possible. Any pieces that could be reused in the dam’s reconstruction—like much of the iron hardware—were saved and cataloged. Most of the wooden beams and planks had to be replaced, but Stein said the dismantling revealed an unexpected surprise. An interpretive trail linking the dam to the parking area was also developed. “Highlight of My Life” After three years of fund-raising and planning, reconstruction of the dam began in 1995. It was an arduous process that required 140,000 board feet, Stein said, all of which was pretreated to prevent rot. The entire process gave those who worked on the project an even greater appreciation for the dam’s original builders, not to mention the trees that went into its initial construction. Initially projected to be a two-year project, most of the work of rebuilding was done in about a year, Stein said. Stein noted that the dam is not the only authentic piece of Round Lake’s logging past that’s still standing. You can take in a lot more than local history on a trip to the Round Lake Logging Dam near Fifield. The journey will take you past some of Price County’s most beautiful natural features. Just a few miles from the dam is the 13-mile loop off Hwy. 70 that forms Rustic Road 105. 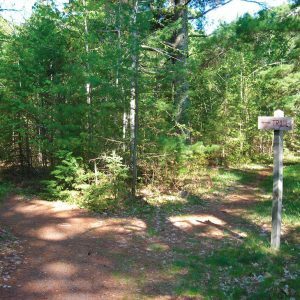 This scenic road winds through the Chequamegon-Nicolet National Forest, which offers great hiking, biking, ATVing and UTVing, and camping. 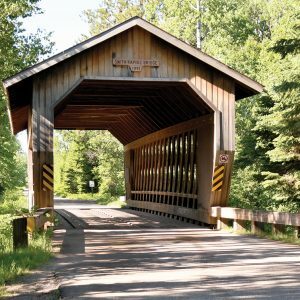 It also passes through the iconic Smith Rapids Covered Bridge (left), spanning the South Fork of the Flambeau River, a popular spot for canoeing and kayaking. This bridge was built in 1991 with a diamond-shaped truss pattern called the Town Lattice. It’s the only glue-laminated Town Lattice covered bridge in Wisconsin. The Smith Rapids Covered Bridge is located at N14900 Smith Rapids Road, 14 miles east of Fifield on Hwy. 70 and north 2 miles on Forest Road 148. The Round Lake Logging Dam is located at N15296 Logging Dam Road. From Fifield travel east on Hwy. 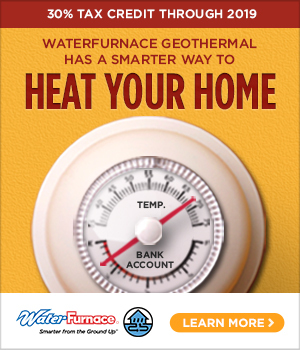 70 for 18 miles to Forest Road 144. Turn north and travel 2.5 miles to Forest Road 535. Turn right to the parking lot area. For more information about these and other Price County attractions, visit co.price.wi.us or call 715-339-3089.